Circus art is diverse, non-verbal and offers endless possibilities of application which supports the participation of a diverse group of people. For instance, social circus is suitable for participants who have special needs in interaction, movement, sensory use, or learning. The emphasis is not on challenges or obstacles, but on resources, enthusiasm, collaboration and, of course, circus art. The social circus concept supports community and group formation through play, games, different circus activities and a unique atmosphere. The social circus concept has existed throughout Europe for decades. The family circus concept developed by PiiPoo cultural centre is based on the social circus concept. The family circus aims to get the whole family engaged in circus arts both jointly and individually. Equality is achieved through mutual practice, support, performance and engagement. PiiPoo coordinated the training which was part of the social circus workshop model taken to Galway community circus in Ireland on 11-16 June 2015. 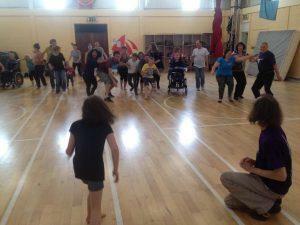 During the five-day training session in Ireland, the social circus activities and disability in social circus were examined. The aim was to launch the family circus model in Ireland and to enable children and young people with disabilities to continue participating in circus activities in the future. The trainers on the course included PiiPoo’s social circus professionals and a 14-strong family circus group. The training consisted of theoretical instruction and circus workshops. The trainers and the family circus group were joined by some Irish peer families. As part of the training, a mini seminar was organised involving local decision-makers, funding bodies and health and welfare operators. The concept was also presented to the public and project partners via the family circus performance of Kalevala. A total of 13 circus professionals from all over Ireland participated in the training. Thanks to this project, several permanent family circus groups have been founded in Ireland, as well as experimental and development work to promote the circus activities of special children, young people and other vulnerable groups. The project was a strategic partnership project of the European Union’s Erasmus+ Youth in Action programme.